BraveWords.com correspondent Deb Rao recently caught up with DOKKEN frontman Don Dokken recently and the legendary singer discusses his upcoming vocal surgery, the band's recent West Coast tour dates with THE SCORPIONS on their farewell tour, the passing of his musical comrade RONNIE JAMES DIO (BLACK SABBATH, HEAVEN & HELL, RAINBOW, ELF), and upcoming spring acoustic solo tour plans. 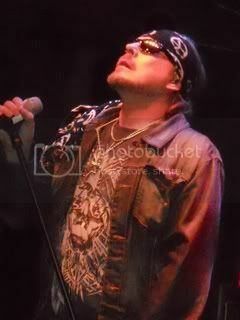 BraveWords.com: Dokken is going to be doing your pre-holiday run in California. Are these your final tour dates for the year? Dokken: "That is it for this year. The California dates are the last ones. We are done for the year. I am taking October off because I am going to have surgery on my voice. I have been struggling with my voice for six months. I got nodes and they need to be cut off my vocal chords. So I am going to take a month off and get surgery and get my voice back. Those three shows will become an audition to see what my voice sounds like. It will be interesting to see if it sounds like 1985 again." BraveWords.com: On May 16th, we lost one of the greatest singers in metal, Ronnie James Dio. What were your thoughts when you heard he had passed away? What are your fondest memories of Ronnie and the making of the 'Stars' video? 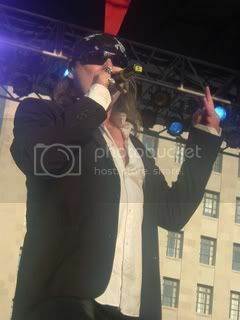 Dokken: "I wore a white suit. I did it on purpose because I knew everybody was going to show up in leather jackets." BraveWords.com: I must say, you really stood out with that outfit. Dokken: "I wanted to stand out. God bless Ronnie. He kept making fun of my suit. I said I wanted to look different. Even at 67, he could out sing any 25 year old. He had a gift from God. He could sing like a monster. When I was on tour with him I used to say, 'how do you sing that great every night?' I used to have my good night and bad nights. I asked Ronnie once, 'What is the secret? Do you drink some special tea or honey?' Ronnie told me, 'Don just go out and do it. You just go out and do it.' I said, 'that’s it?' There is no secret there is no special herbal tea or something? I said, 'OK.' So that is what I did for 20 years. There are certain people in the world like Glenn Hughes (ex-DEEP PURPLE, BLACK SABBATH) or Ronnie that could sing like they were back in the '80's. But I don't know of a lot of singers that can sing like back in the '80's. I love Rob Halford (JUDAS PRIEST). Bruce Dickinson (IRON MAIDEN). They all sound the same. QUEENSRŸCHE and Geoff Tate still sounds amazing. Some guys can do it. I got away with it for 20 years." 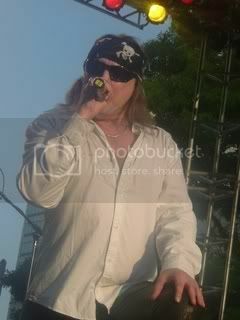 BraveWords.com: Speaking of Queensrÿche in 2008, you did an amazing acoustic tour with them. Any plans to maybe do acoustic solo acoustic tour? Dokken: "That was interesting. I am going to do another acoustic run in the spring. I am going out by myself not even with Kelly Keeling in March, April and May. I can't tell you who with yet because it is not inked. I did an acoustic show with Y&T; at The Fillmore a couple of months ago as an experiment to see if I could pull it off by myself and it worked out OK."
BraveWords.com: You are a great storyteller. Dokken: "Yes, I told some stories. Like Mick says, you got a million stories Don. It was great playing with Y&T. ; I just talked to Phil Kennemore. He is getting chemo. I just pray he makes it because I love that guy. He is one of the sweetest guys in the world. He has cancer. We are all getting up there, people are going and coming. We blessed that we are here everyday. We got to count everyday." 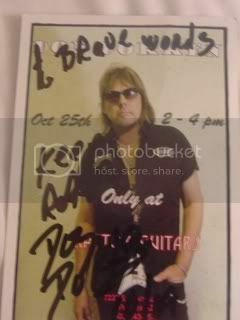 BraveWords.com: Any closing words for the Dokken fans that have stood by you for nearly 30 years? Dokken: "I just love them for showing up to our shows for all these years. What is the old joke,” You can throw a party and nobody comes it is time to stop throwing a party." So far they are showing up! I give it my best and it is all I can do. I have good nights. When I can't sing 100 percent I feel bad. Sometimes I feel I am not giving it my all, but I am trying my hardest. It has been a long fight for the last year. I have a tear in my vocal chord. I have good nights and bad nights. It doesn't help when it is 30 degrees outside and freezing cold." BraveWords.com: It is not easy being on the road day and day out. You have a lot to be proud of and your solo album, Up From The Ashes is one of my favourite albums to listen to still today. Dokken: "Yes, But I paid you ten bucks to say that. (Laughter) I love that album. I am very of proud of that album. That was a great album and it had some amazing songs on it 'Stay' and 'Mirror Mirror.' It was good sonically. All the guys in the band were amazing players. It got voted one of the best albums of all time in Burn Magazine in Japan. It was voted one of the Top 10 Best Records in the last twenty years. I went you didn't pick a Dokken record, you picked Up From The Ashes? It was a great album. I am proud of it. BraveWords.com: Any plans to tour Europe in 2011? Dokken: “Yes, I will be doing some stuff. We'll see how it goes. Stay tuned to the website for 2011 tour dates”.